Home Asia	Osaka Takoyaki Museum: A Delicious Experience in Osaka! Osaka is famous for takoyaki, a ball-shaped fried snack made of octopus, green onions, mayonnaise, Worchester sauce and bonito flakes. I had never tried authentic Japanese takoyaki before, so when I read about Osaka Takoyaki Museum, I immediately wanted to go there! As you can try many kinds of takoyaki all under one roof, Osaka Takoyaki Museum is one of the best places in Osaka to eat takoyaki. Osaka Takoyaki Museum is located in a mall called Universal City Walk Osaka next to Universal Studios. From Osaka Station, you can get there by taking the JR Yumesaki Line to Universal City subway station. The ride takes 15 minutes. Despite its name, the Takoyaki Museum is actually a food court. There are five different stalls, each serving a different type of takoyaki. I arrived around 7pm, and the Takoyaki Museum was quite busy, with very few empty seats. Many visitors seemed to have spent the day at Universal Studios (some were holding Minion or Snoopy stuffed toys and were wearing themed hats) and were now having some takoyaki for dinner! The Takoyaki Museum was full of many interesting sights and sounds. A young employee dressed as an octopus was advertising one of the stalls in rapid, enthusiastic Japanese. 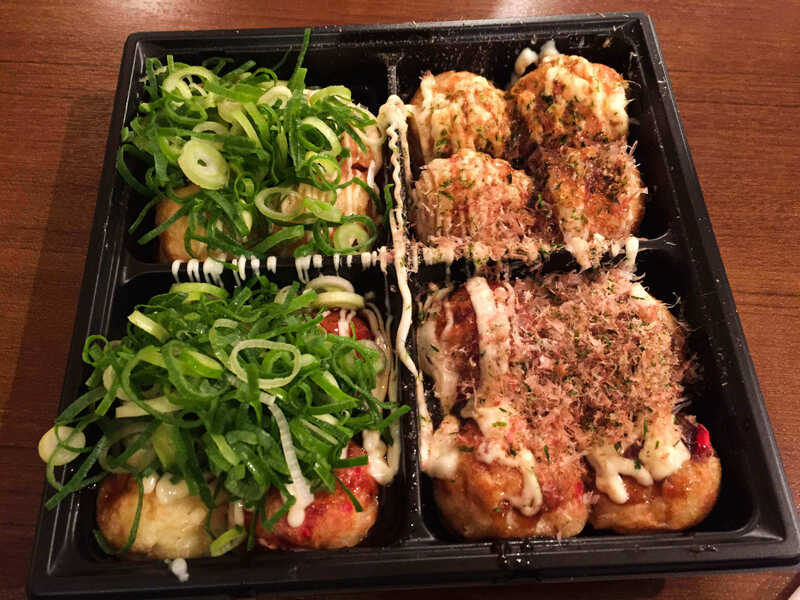 At each stall, cooks expertly and quickly prepared takoyaki in special round pans, carefully rotating each ball to make sure they were evenly cooked. In the background, the cheerful song “Welcome to Osaka Takoyaki Museum!” played over and over again. There are machines at every stall where customers can place their orders. Each machine has pictures and descriptions of combos and orders (in Japanese) and you simply have to press a button and insert money to order. Next, the machine dispenses a small ticket which you give to someone at the stall. After that, you receive our order. I tried about 3 stalls- one with the classic takoyaki flavour, one with a special cheese flavour and a set with a variety of different flavours. One time, I inserted my money into the machine without pressing any buttons, only to have it spit out an order ticket that I couldn’t read! I decided to just try whatever takoyaki I had ordered, and it turned out to be really good. After stuffing myself with takoyaki (I must have eaten at least 20 pieces! ), I decided to check out the gift shop. It was selling a lot of takoyaki-themed merchandise- coin purses, keychains, t-shirts, slippers, stationary. There was also a lot of takoyaki snacks like takoyaki chips and instant takoyaki. There were even takoyaki pans for sale for people who want to try making takoyaki at home! Even the entrance to the washrooms is decorated with takoyaki! Osaka Takoyaki Museum was a wonderful experience, and definitely one I would recommend to people visiting Osaka who are interested in trying authentic takoyaki! I’m craving takoyaki just from writing this blog post, and I can’t wait to go back to Osaka and pay another visit to the Takoyaki Museum. That takoyaki is soooo cute! I agree! Japan has so many cute characters and mascots. I am not that adventurous with food but i like your boldness. hope it was delectable. cool art from Museum. It was delicious! 🙂 I still dream of the food there! It certainly is a creative and delicious dish! I LOVE TAKOYAKI! It looks so good and the character is adorable! We are headed there in August, so this is very timely. I have heard about takoyaki a bit, but never tried it. We won’t be in Osaka, but hopefully we can try it in Kyoto. The photos look yum! There are takoyaki stands in Kyoto as well. 🙂 Definitely try some if you can! I hope you have a nice time in Japan. Well takoyaki sounds delectable! Never eaten that but still. So adorable devoting a museum to… takoyaki! It’s definitely the cutest food court/museum I’ve ever visited! This place seems so awesome. Certainly some place I’d like to visit, and even bring my kids. Love it! I don’t think I’ve ever had octopus before, but based on your description, it must be delicious! This place looks super cute too! I love all the decorations. This museum seems so interesting and fun! Loved the food there, Kat!